Congratulations to William Floyd High School senior Hasani Rathan who recently took home his second gold medal of the year at the New York State Public High School Athletic Association Outdoor Track and Field Championships. Mastic Beach, NY - June 25, 2015 - Congratulations to William Floyd High School senior Hasani Rathan who recently took home his second gold medal of the year at the New York State Public High School Athletic Association Outdoor Track and Field Championships held at SUNY Albany with a high jump of 6’ 10” – the same height that brought him the gold at the New York State Winter Track Championship held at Cornell University in March. Additionally, senior Dwight Corley also picked up a medal with a fourth-place finish in the long jump event with a leap of 22’. Both student-athletes will be taking their talents to the college level in the fall as Rathan will attend the University at Buffalo and Corley will attend Buffalo State. 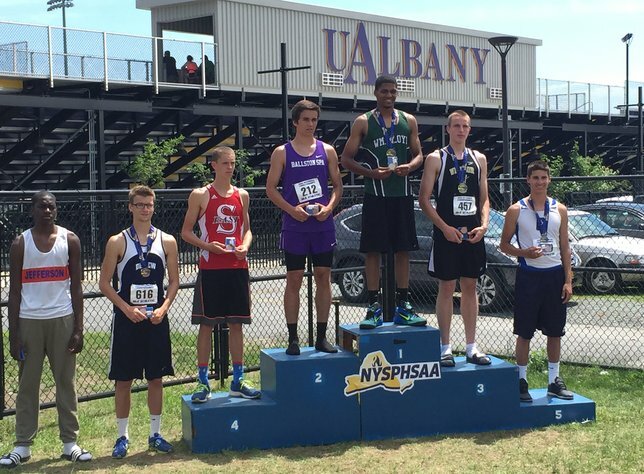 Pictured: Hasani Rathan on top of the medal stand after his high jump victory at the NYSPHSAA Outdoor Track and Field Championships. Pictured in Gallery: Dwight Corley (left) and Hasani Rathan (center) with boys track head coach Ed Noll at the spring track and field All-County Awards ceremony. Dwight Corley finishes a jump at a meet earlier this year. Subject: LongIsland.com - Your Name sent you Article details of "William Floyd Student Athletes Take Home Top Awards at Track & Field Championships"